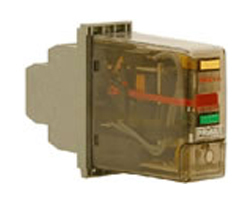 PRiMA is a compact, voltage-operated, attracted armature auxiliary relay with instantaneous and time delayed auxiliary functions. Developed as a result of worldwide market studies the PRiMA auxiliary relay fulfils the need for contactmultiplication in protection and control environments. It is easy to configure and install and is compact in design. PRiMA fulfils the need for contact multiplication in protection and control environments. Developed as a result of worldwide market studies, great emphasis has been placed on facilitating specifications, orders, configurations and installation. It has a wide operational voltage range and is made from flame-retardant materials.